Between the months of July and September, the Museum exhibits his work exclusively, but at other times in the year, his work is combined with exhibitions of other works. The Museum building itself is quite striking, thanks to the design of the Catalan architect, Luís Domènech i Montaner. In the 1880S, it was the home of the Montaner y Simón Publishing House. 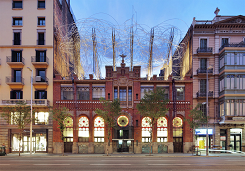 It opened as the Antoni Tapies Museum in 1990. Born in 1923, he set out for a life in law but his outlook changed after an accident. He began drawing and while spending time in a sanatorium in the early 1940s with pneumonia, he resolved to continue with this. He spent a period in Paris from 1946 where he was influenced by ‘’Art Brut’’ and reduced his creations to basics, incorporating everyday materials in this work. He met Picasso and took part in several exhibitions at the time. He also became politically active. Much of his work reflects the time in which he was living; at one point in his life he was jailed by the Spanish Dictator, Franco for using four red stripes, a representation of the Catalan flag, in a painting. The themes regularly represented the suffering and oppression of the people during Franco’s rule. His drawings throughout the 40s and his paintings over the following two decades are on display, as well as some sculptures he produced in the 1990s. Tapies and his wife added works on a daily basis to the initial exhibition, once it had opened, and perhaps the one that every visitor should see, even if they do not understand its meaning, is ‘’the Sock’’? 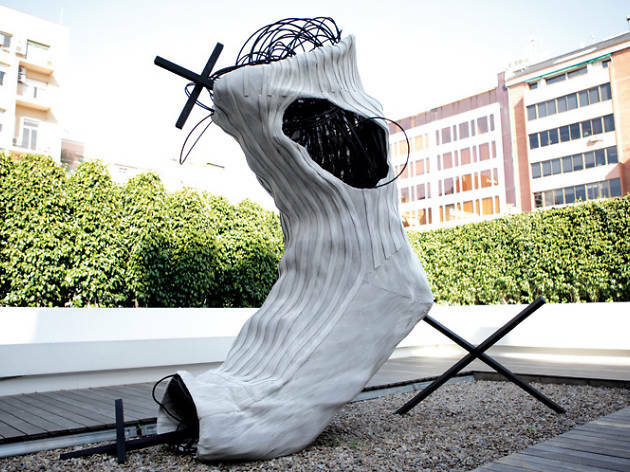 It stands on the Terrace at a height of 2.75 meters, a sock that certainly divides opinion between creative and ridiculous. It would be interesting to know what every member of the family thinks about it. His work is not to everyone’s taste but he made a huge contribution to contemporary and modern art in post War Spain. He produced over 8,000 works during his long life and died in 2012. The Museum opens six days a week; closed on Mondays. It is included within the attractions a family with a Barcelona Card or ArtCard can see at no further cost. Otherwise it is 7 euros with a reduction for students. There is an English Audio Guide included in the price which covers the Tapies work but not the exhibitions displayed on a temporary basis. Organised tours can be booked by prior arrangement. Well, what do you think? Have a great stay in our family hotel in Barcelona.